Besan paratha or masala besan paratha is a wonderful Rajasthani paratha recipe which is prepared by stuffing spicy besan or gram flour filling in the whole wheat dough. This paratha is crispy, aromatic and filled with the pickled flavor besan stuffing makes it a wholesome meal. You just need curd or raita to pair up and a meal is complete. Besan paratha makes a great option for brunch or lunchbox and goes very well for any short duration traveling. Boondi raita, Carrot raita, and Suva raita are a perfect choice for this paratha. To make besan paratha first we make a soft dough which is kept aside for 10 minutes. Besan or gram flour is roasted with chopped onion, pickled spices, green chili, and green coriander. Furthermore, add some water to combine all together. Stuff this filling in whole wheat dough balls and just fry the paratha or flatbread from both sides till golden brown. 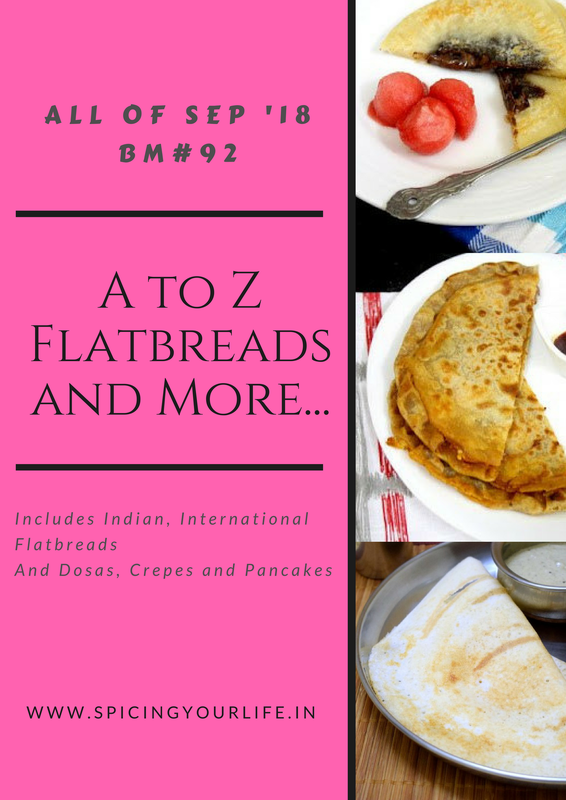 For the letter B, I chose besan paratha in A to Z Indian Flatbread series. We make it whenever we are running short of grocery. Such a delicious and lip-smacking Indian Flatbread which goes very well with tea. So let see how to make this delicious, crispy, pickled flavor, achari besan paratha or masala besan paratha. First of all, in a mixing bowl gather all ingredients listed under the dough and make a smooth dough. Keep it aside for 10 minutes to set. Now heat a kadhai on medium heat. Add cumin seeds, kalonji or nigella seeds, and fennel seeds. Let them splutter. In addition to this add grated ginger and garlic along with asafoetida. Just stir for few seconds to remove the raw smell of garlic. Furthermore, add chopped onion and cook for 2-3 minutes till onion turn a bit golden in color. As soon as onion color changes add red chili powder, turmeric powder, salt, kitchen king powder and dry mango powder. Mix well. In addition to the spicy mixture now add chopped green chili and chopped green coriander. Mix well. The reason behind adding both of them at this stage is to make their rawness a bit intact. Which you will realize while munching on besan parathas. Finally, add besan or gram flour. Combine everything nicely and then add the mentioned quantity of water. Cook on low flame while you are binding everything. Adjust salt as per taste. Besan filling is ready now. Let it cool down to attain the temperature you can bear to touch. Divide the mixture and dough into equal portions. I could make 7 parathas or flatbread of 6-7 inch diameter. Roll one dough ball into a 3” circle. Place besan mixture and seal the dough ball carefully. Press gently from both sides and roll it up to 6-7 ” big paratha. Roll gently, the stuffing may come out but don’t worry. Just seal and go on rolling. Heat a griddle on medium flame and place this rolled paratha. Flip it on another side when you see little puffed up. Apply some oil and cook from both sides till golden brown. Besan Paratha or Masala Besan Paratha or Achari Besan Paratha is ready to serve with curd or raita or tea. Enjoy. Add water carefully. You need only to bind everything together. It should not be runny or watery. Roll them gently, the filling may come out. But just seal it and roll it again. Wow innovative way, we do besan partha, but not achar and besan together. would love to try this. Your parathas are perfectly stuffed and rolled.. looks so inviting. The filling must have added so much of flavor to the paratha! I am bookmarking so many recipes from this edition! Such a fantastic stuffing and sounds like a filling meal by itself. Very nice choice!.. wow Bhawana, these parathas look just too tempting. Must admit have not had a savory chana flour filled paratha. Definitely worth trying out this recipe. Awesome ! The minute you say the word Achaari , I start drooling , besan and achaar is such a wonderful delicious combo , would love to try this version . I am not a big fan of besan paratha, but with this lovely achari filling, I am sure I will love it. Love the whole platter and the setup! Besan paratha is new to me. It looks so yum. The addition of achar must add a nice spice to the parathas.. I had besan paratha in my list as well. But my family voted for boondi paratha. This one sounds just flavorful. I shall try this sometime. Wow, thats a fantastic stuffing Bhawana, am in love with this achari besan paratha. Never thought of this stuffing yaar. Cant wait to try this soon.